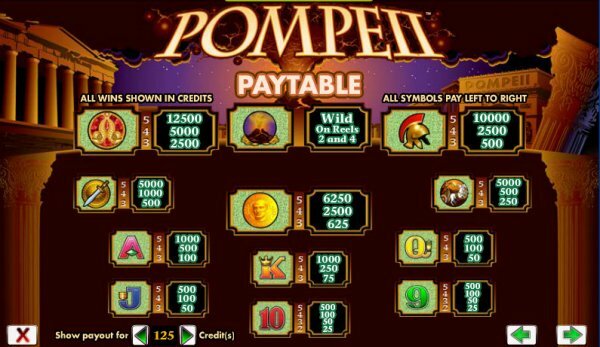 The theme of the Pompeii slot game is based on the story of the wealthy Roman city that was destroyed and covered in volcanic ash many centuries ago, when the volcano Vesuvius erupted. This game is still one of the favourite games in land based casinos all over the world, and the online version is also becoming popular at online casino singapore. Pompeii is produced by the Australian developer Aristocrat, and has five reels and 243 ways to win. These 243 ways to win are more rewarding to play than the fixed number of pay lines. As long as the matching symbols, including Scatter symbols, appear on adjacent lines, reading from left to right, you will have a win. The background to Pompeii shows all the beautiful buildings of the city before the disaster struck. The volcano is in the distance, already spewing smoke and fiery lava. The symbols are all related to Rome and Romans, and you will see a Chariot, a gold Coin, an Amulet and a Roman Helmet, and an ornate Sword as well as the fatal Volcano. There are also the traditional playing cards from ten to Ace that form the lower paying symbols in the game. The Volcano is the Wild symbol, and as such can substitute for any other symbol in a winning combination. The Volcano only appears on reels two and four. If it appears on reel two all wins will be multiplied by three, and if it appears on reel four and forms part of a winning sequence, it will multiply all your winnings by five. If it appears on both reels on an active pay line, you will get a multiplier for your wins of fifteen. The gold Roman Coin is the Scatter, and will be the symbol that activates the free spins bonus round. The gold coins are in scribed with Julius Caesar’s famous remark, “I came, I saw, I conquered”. 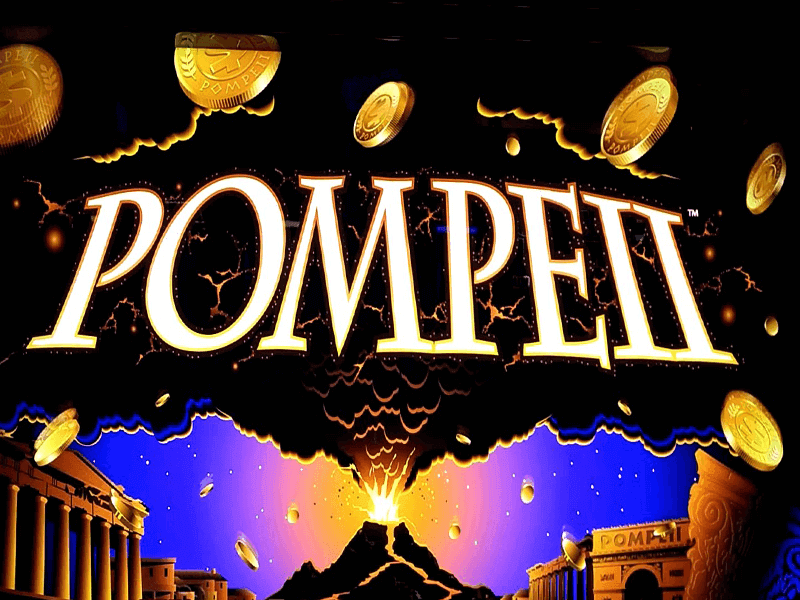 Each time you make a big win, the screen of the game Pompeii shakes as if Mount Vesuvius was about to erupt again. The Free Spins feature in Pompeii is activated by the appearance of three or more gold Coins on the first three reels. The number of free spins you are awarded will depend on the number of Roman Coin Scatters you have found. Three gold Coins earns you ten free spins, and if four of the gold Coins appear on the reels you will get fifteen free spins. If five Scatters are found together on the reels you will be awarded twenty free spins. This bonus round can also be retriggered during the feature. The Volcano Wild can also become a multiplier, if it acts as a replacement for another symbol to complete a winning combination. If the winning sequence occurs on reel two, your wins will be multiplied by three. If the Volcano forms a win on reel four, your payout will be multiplied by five. If you are lucky and the Volcano appears on both reel two and four to complete the winning combinations, your winnings will be multiplied by fifteen. This is the source of most of the big winnings in Pompeii.